An F-35 jet arrives at its new operational base at Hill Air Force Base, in northern Utah, Sept. 2, 2015. With the finalization of a sweeping defense policy bill, Congress is a step closer to blocking Turkey from acquiring U.S.-made fighter jets, a big priority for some lawmakers looking to rebuke the country’s human rights abuses but which administration officials have warned could have unforeseen consequences. Sens. Jeanne Shaheen, D-N.H., and Thom Tillis, R-N.C., Tuesday hailed the inclusion of their amendment in the annual National Defense Authorization Act delaying the delivery of F-35 Joint Strike Fighter aircraft to Turkey until the Pentagon delivers a report to Congress that includes an assessment of Turkey’s potential purchase of Russia’s S-400 air and missile defense system and the effect of such a purchase on U.S.-Turkey relations. U.S. lawmakers have expressed concerns about Turkish Prime Minister Recep Tayyip Edrogan’s embrace of authoritarianism within Turkey, exemplified in last week’s post-inaugural strengthening of his own executive power. 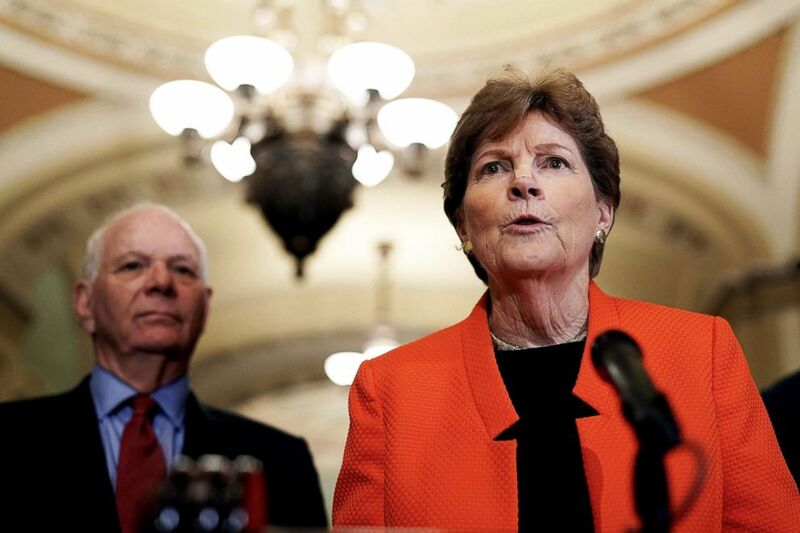 U.S. Sen. Jeanne Shaheen speaks as Sen. Ben Cardin (left) listens during a news briefing after a weekly policy luncheon on July 17, 2018 at the U.S. Capitol in Washington, D.C. But they have said the measure in the defense bill is a response specifically to his imprisonment of U.S. pastor Andrew Brunson and other Americans who lawmakers say are being unjustly held. “Senators Shaheen and Tillis felt it inappropriate and dangerous to send Turkey F-35 aircraft at this time, while the Turkish government continues to wrongfully imprison Americans and U.S. embassy staff,” Shaheen’s staff wrote in a statement. Shaheen has also noted that the F-35 sales are incompatible with the air defense system Turkey is contemplating purchasing from Russia. “There is tremendous hesitancy [about] transferring sensitive F-35 planes and technology to a nation who has purchased a Russian air defense system designed to shoot these very planes down,” Shaheen told Reuters previously. 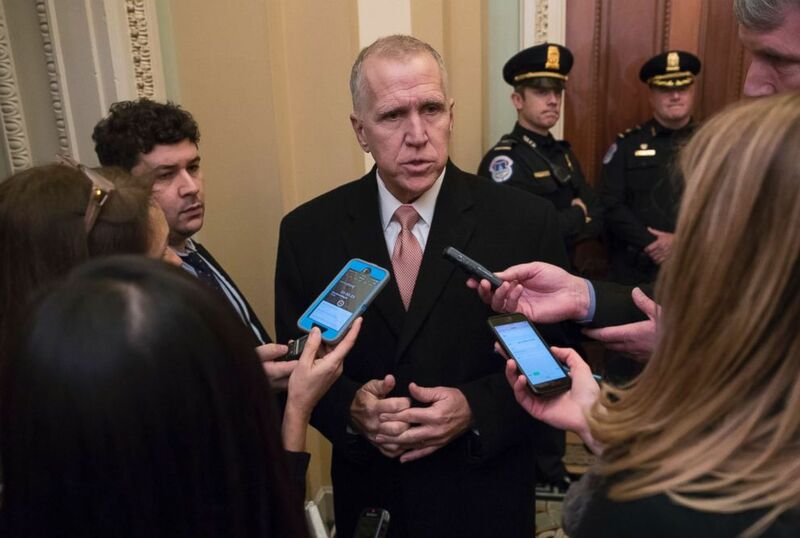 Sen. Thom Tillis is surrounded by reporters as he makes his way to a closed-door GOP policy luncheon, at the Capitol, Jan. 4, 2018. Stephen Ganyard, an ABC contributor and military analyst, noted that the halted sales would represent the latest step in Erdogan’s deliberate shift away from Western nations, and that the amendment in the National Defense Authorization Act is a response to both immediate and more geostrategic concerns that Congress has with Turkey. “This is ostensibly a reaction to Erdogan saying he is going to buy Russian S-400 missiles which NATO objects to and won’t allow to be integrated in its air defense systems,” Ganyard said via email. Defense Secretary James Mattis has expressed sympathy for lawmakers' concerns about Turkey's abysmal human rights record and their potential purchase of the Russian defense system, which he said Washington was pushing Ankara not to acquire. But has also warned Congress not to restrict the F-35 sales. In a letter to Rep. Mac Thornberry, R-Texas, earlier this month, Mattis wrote that "removing Turkey could trigger a supply chain disruption for the US military and our partners, as well as increase other program costs," according to a copy of the letter obtained by CNN. Brunson has been imprisoned since October of 2016, indicted on what the senators call “bogus” charges related to terrorism and espionage. Sens. Shaheen and Tillis, along with Sens. James Lankford, R-Okla., and Lindsey Graham, R-S.C., have been vocal in urging the Erdogan government to release the Americans, and have worked on several pieces of legislation, including a measure in a separate appropriations bill that would sanction Turkish officials complicit in the Americans’ unlawful arrests. Turkey has planned to purchase 100 F-35s and technically owns the jets, having invested $1.25 billion into the project since 2002. Turkey officially received its first batch of planes late last month, during a ceremony at Lockheed Martin’s F-35 facility in Fort Worth, Texas. But the planes will remain in the United States until at least November 2019 – ban or no ban – while Turkish pilots receive training at Luke Air Force Base in Arizona. During the ceremony, top Turkish defense official Serdar Demirel spoke about Turkey’s commitment to NATO. “While Turkey is continuing to serve the global peace and security as a reliable and stable NATO ally, F-35 will help protect our country's territorial integrity and the security of our nation for the future generations,” he said. Turkish Prime Minister Binali Yildirim, whose post was abolished as part of Erdogan’s power-centralizing decree last week, had previously said that the ban’s language was “unfortunate” but that it wouldn’t prevent Turkey from acquiring similar technology somewhere else. “Turkey is not without alternatives. Such attempts are regrettable and goes against the soul of strategic partnership,” Yildirim was quoted as saying in June after the Senate first approved the language. “They said, ‘Well, the difference is when we fight, they can't see our plane.’ I said, ‘That sounds like a big advantage,’ right?” he said, laughing. ABC’s Elizabeth McLaughlin contributed to this report.